NBA 2K18 review: "Throws a new gauntlet down to the rest of sports gaming"
Its generation-long strengths hold true, and just about prevail over an increasingly cynical microtransaction creep. My Career’s jump to an open-world setting throws a new gauntlet down to the rest of sports gaming. For the best part of a decade, NBA 2K has been streets ahead of other sports franchises. This year, it does so literally, expanding MyCareer mode into an open-world street setting in which barbershops, team training facilities, multiplayer courts, and dozens of human players all occupy the same urban space. FIFA, Madden, and the rest were only just catching up to the idea of star-studded cutscenes, and before they can catch a breath NBA 2K goes San Andreas. MyCareer, for the uninitiated, lets you create a player and take them from obscurity to NBA stardom via a series of narrative cutscenes and hours of on-court hustle. Despite the depth of its other modes such as MyGM (franchise mode to you and me) and FIFA Ultimate Team-alike MyTeam, it’s this rags-to-LeBron mode that has long been the main attraction. 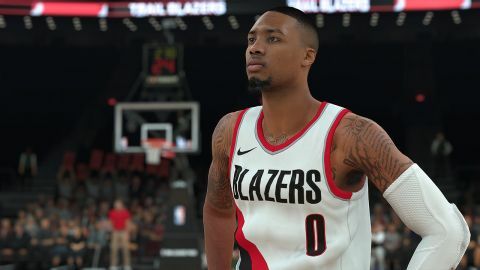 Knowing that, developer Visual Concepts has rightly focussed most of NBA 2K18’s innovations here, and by placing it inside an open world where multiplayer modes also reside, it gives the sense that MyCareer is a broader experience than just grinding out training drills and NBA games until you hit that 99 rating. Except, of course, that there’s an awful lot of that too. Even a Korean MMO would say MyCareer was a bit grindy. Unless you cave and buy VC for real money, the journey towards accomplishing even simple layups and jumpshots in career or multiplayer games is agonizingly long. As someone who’s ground their way up from an overall 60 rating to the 90s many times since NBA 2K11, I can confirm that it still requires the patience of a major religious figure in 2K18. And as someone who’s also caved and paid real money to hurry the process along several times over that same span, I can’t help but wonder how deliberately the game’s designed each year to foster that temptation. And how much it’s been ratcheted up this year. For example, in order to improve your starting stats from 60 up to 85, the initial level cap, you need to spend somewhere in the region of 200,000 VC. Playing on Pro difficulty, one decent career game (earnings scale with your performance) earns you about 1000. That’s without budgeting for haircuts or any other visual customisation changes, all of which cost VC. A new pair of tracksuit bottoms might set you back 2500. Imagine that. Imagine a real NBA pro popping down the shops and spending one game’s worth of salary on some Jordan pants. However, it isn’t a Pay-to-win scheme, in the sense that you can’t ascend all the way to the top by parting with your actual, real money. Shelling out for the requisite 200,00 VC will get you from 65 to 85, but getting all the way up to 99 requires time and devotion which can’t be bought. Two things achieve this: cap breakers and badges. To understand why these are important, a quick history lesson is required. Last year’s game took flak for introducing stat caps based on particular player archetypes, so that a six-foot, three-point specialist of the Steph Curry mold couldn’t also become a league-leading rebounder, and if you gave your player Manute Bol’s dimensions you couldn’t buy him Muggsy Bogues’ speed. It makes sense from a basketball perspective, but many players found it restrictive. Particularly those who’d enjoyed creating a Michael-Jordan-but-seven-feet-tall archetype in previous years, and had been able to dominate in all aspects of the game. Attributes are capped once again this year, but with the introduction of dual archetypes you do at least get a bit more control over how they’re capped. For example, if you really did want to be a lights out three-point shooter while also excelling at rebounding, you could build a player with those two archetypes. They’ll still be limited by physical traits - height, weight, wingspan, shoulder width - but in theory you have more freedom to play the way you want. In reality, my 6”10 rebounding slasher is… okay at both. It feels like there are more ways to create a terrible archetype than a great one, particularly if you want to play a lot of multiplayer with them, but the dual archetype system is a step in the right direction, and is worth experimenting with. It’s just a shame all the MyCareer cutscenes are unskippable, so starting again with a new build takes more time than it should. Why did you have to be a… cap breaker? Enter the first of 2K18’s big time investments: cap breakers. Those initial attribute caps can be raised substantially, but the only way to do it is with hard work. Career games, multiplayer, gym work and training drills will all fill up a cap-breaker bar, and happily it fills much quicker than last year’s glacial Doin’ Work Meter (seriously, that’s what they called it. They might as well have named it the ‘That’s It, Dickheads, Keep Grinding Away’ Bar), which could only be progressed outside of games. Anyone who spent as long as I did doing the jump test drill last year will be ecstatic to hear that. Next is badges. These permanently buff certain abilities and offer an even more profound effect on your player than several cap-breakers would. The ‘ankle breaker’ badge, for example, will make your crossover and double moves much more effective, whereas unlocking ‘mid-range deadeye’ improves 2-point jumpshots. How these were unlocked and upgraded (from bronze up to diamond) was a bit mysterious last year, but in 2K18 a handy overlay after each activity shows you a) what you did, b) the badge that action counts towards unlocking, and c) how many more times you need to do it before actually unlocking it. It’s great to have all this info presented so clearly, but slightly disconcerting to see how long it’ll take to get a few diamond badges. You have to work hard to get to the top in MyCareer, and realistically you have to drop some coin on it too if you want to hit 99 overall before the heat death of the universe, but as ever the fundamentals of how the game of basketball is played offsets the obvious tedium of the game’s grindier elements. "It’s fun simply to defend your man, or grab a rebound, or run a pick-and-roll." That’s been true for years, of course. NBA 2K was playing a better game of basketball than FIFA or PES could manage with soccer since the PS3/360 days, and every year since then it’s reached out ever closer to perfection. The animations are the foundation of that - every big-name player’s jumpshots, layups, spin moves and rituals are accurately mo-capped, and every tiny defensive foot shuffle and ‘watch that guy’ team-mate gesture sells an uncanny level of believability. Yes, those animations can still feel sticky when you’re controlling a player and they can’t be cancelled, and yes, that can be tremendously annoying at times, but it also facilitates a game of virtual basketball in which it’s fun simply to defend your man, or grab a rebound, or run a pick-and-roll. Hand on heart, is it fun to pass along the back four in PES? That frightening realism shouldn’t be taken for granted, however long it’s been a virtue of NBA 2K. This year doesn’t herald an overhaul in any particular area, but it is bolstered just slightly by new animations in post play, boxing out and lateral movement. Such incremental improvements are the luxury of the established and dominant franchise, and you can’t help but feel that a major engine or physics overhaul is due soon to keep NBA 2K at the top. For now, faking out lockdown defenders and cutting to the rim and dunking on opponents is still just about the most fun you can have in a sports game, and as tempting as it is to focus on the moments where animations go awry, the overall level of play is still formidably impressive. Less impressive is the narrative writing and performance in MyCareer’s storyline, in which a former DJ named DJ earns an NBA contract by winning one street tournament. The mechanics of getting into the NBA aren’t really the problem, although in my opinion last year’s college prelude worked better. Instead, it’s the hours of over-caffeinated mo-cap actors riffing with each other about scenarios of no consequence; tedious exchanges with the security guard every time you’re about to walk onto the court; walking back to your apartment and having to endure your flatmate hosting an improv class. Come back, Spike Lee. All is forgiven. MyGM is also infused with narrative cutscenes, but thankfully they’re nowhere near as tryhard. Generally you’re allowed to go about the business of building a basketball dynasty with satisfyingly deep control of both on-court and off-court affairs. And if you really don’t want cutscenes, Pro-Am multiplayer is your answer. I have had problems with walk-on games, specifically being rooted to the ground and forced to watch my four exasperated team-mates struggle on a man down, but when given control, the basketball flows smoothly, and there doesn’t yet seem to be one archetype that’s dominating multiplayer. Historically 2K has had to do a lot of balance patching to ensure that’s the case, but it looks like the dual archetype system has created enough variation that you’re not always playing a team of five 100% three-point shooters. It feels a bit entitled to criticise NBA 2K18. It’s the biggest, bravest, and for the most part the most sophisticated sports title there’s ever been, but at the same time its VC-grabbing design, largely untouched core gameplay, and remarkably tone-deaf cutscenes indicate that this is a truly great series hitting something of a plateau. It’s still worth buying - as long as you go in knowing that you’ll likely end up paying more again in VC - and more than capable of providing months of enjoyment. More than anything, it creates the illusion of a living, breathing world of sport that’s fascinating to exist in and gratifying to make an impact on, and it deserves recognition for that.